Integrity, the Foundation. People, our Focus. Learning, our Passion. Excellence, our Pursuit. 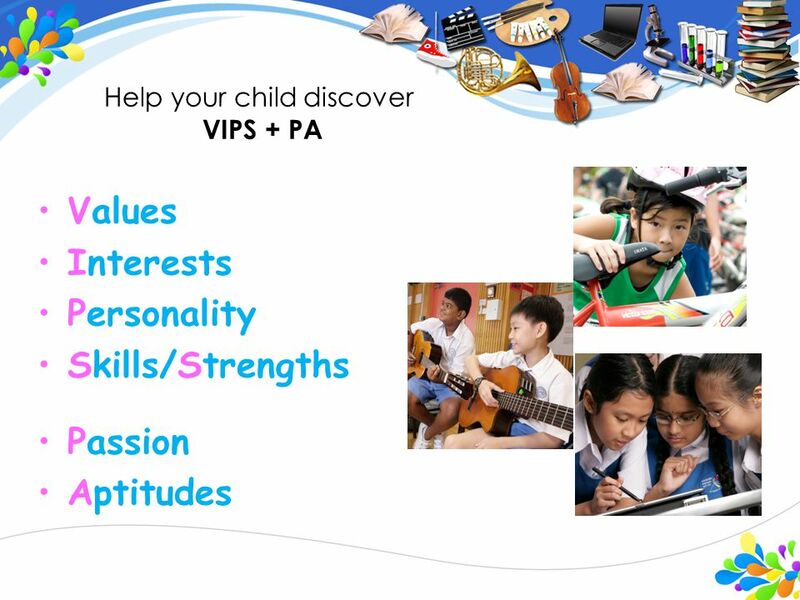 2 Copyright © Ministry of Education, Singapore. 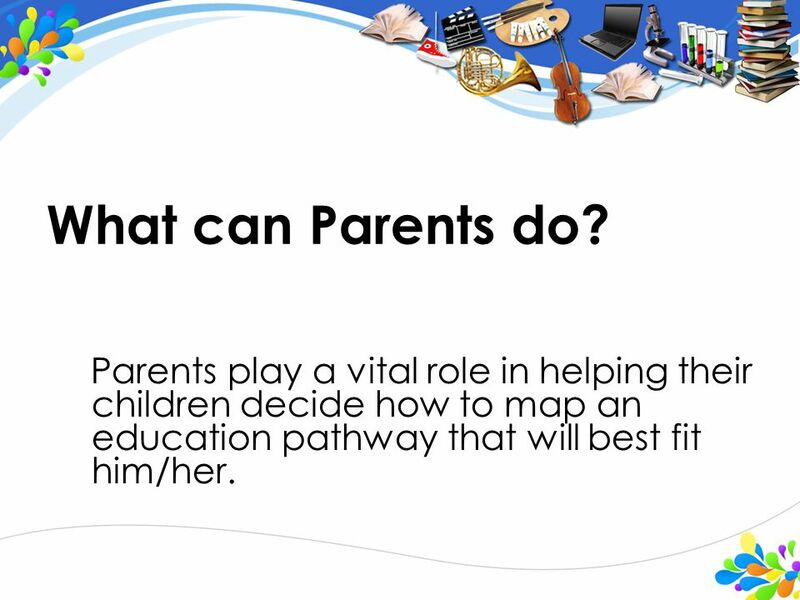 Parents play a vital role in helping their children decide how to map an education pathway that will best fit him/her. What can Parents do? 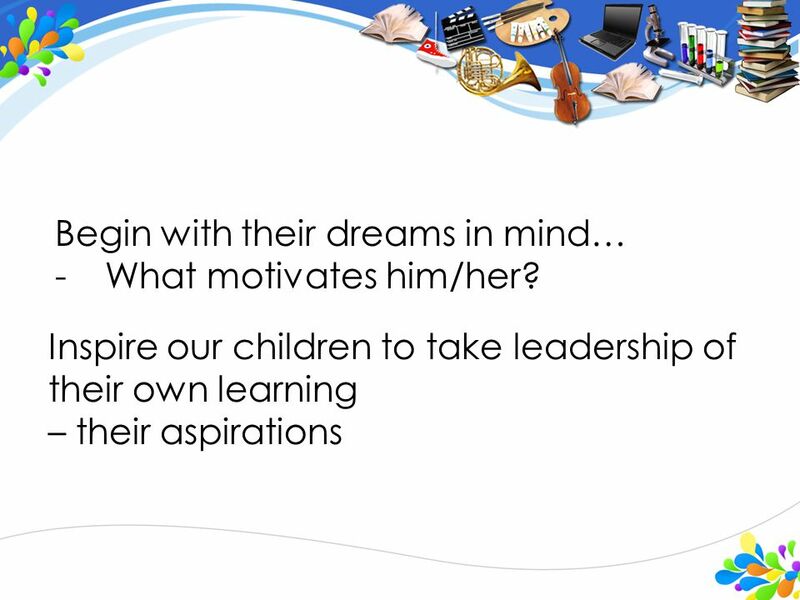 7 Consider the 3P’s 1 P ersonal Characteristics a.How does the school bring out the best in my child? 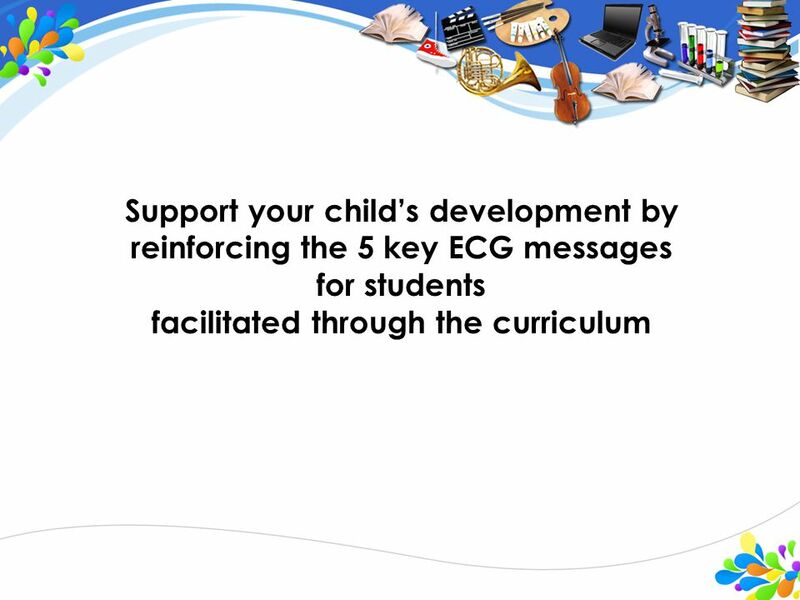 b.What are some existing school programmes that may interest my child and support his/her holistic development? 2 P racticalities a.How far is the school from my home? Will my child be able to go to school by bus or MRT? b.How can I be involved in my child’s education? c.Based on my child’s results, which schools can my child select? 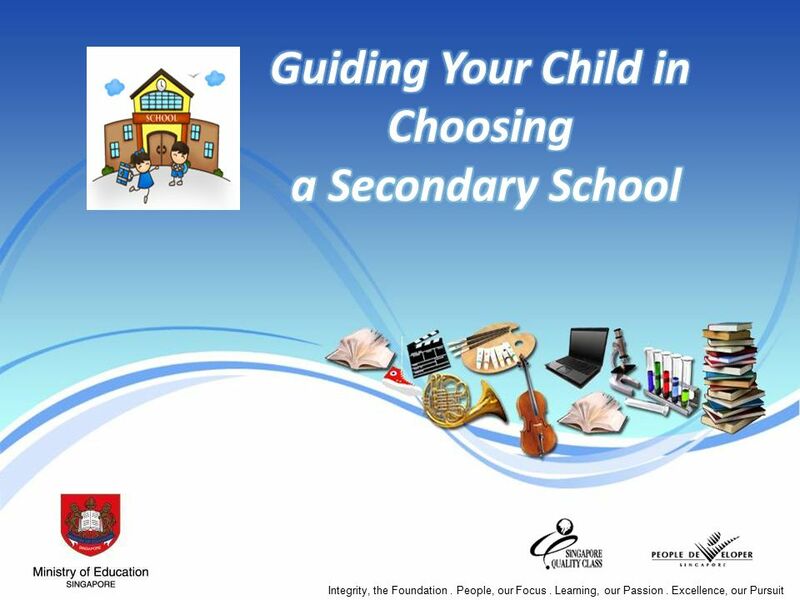 8 3 P rogrammes that the secondary schools offer a.What kinds of programmes do the secondary schools of our choices offer that will help develop my child in his/her strengths, interests? 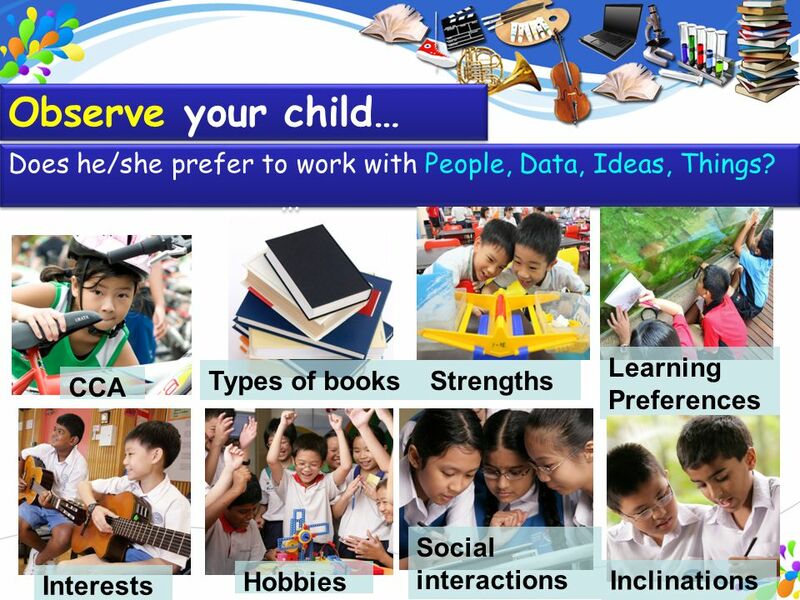 - Niche Programmes - CCAs child is interested in or wants to develop skills for. Eg. Chess club, badminton club, band, dance, uniform groups b. 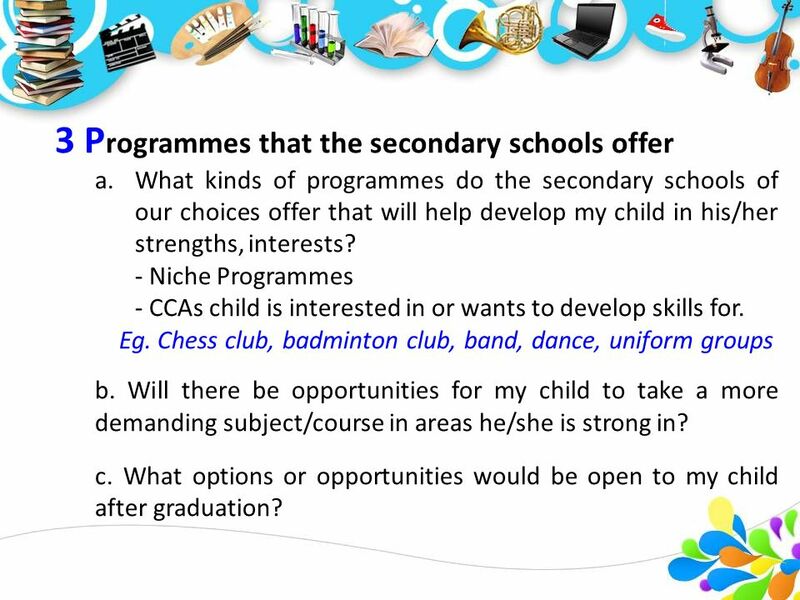 Will there be opportunities for my child to take a more demanding subject/course in areas he/she is strong in? c. What options or opportunities would be open to my child after graduation? 10 To help guide your child in selecting schools 1. 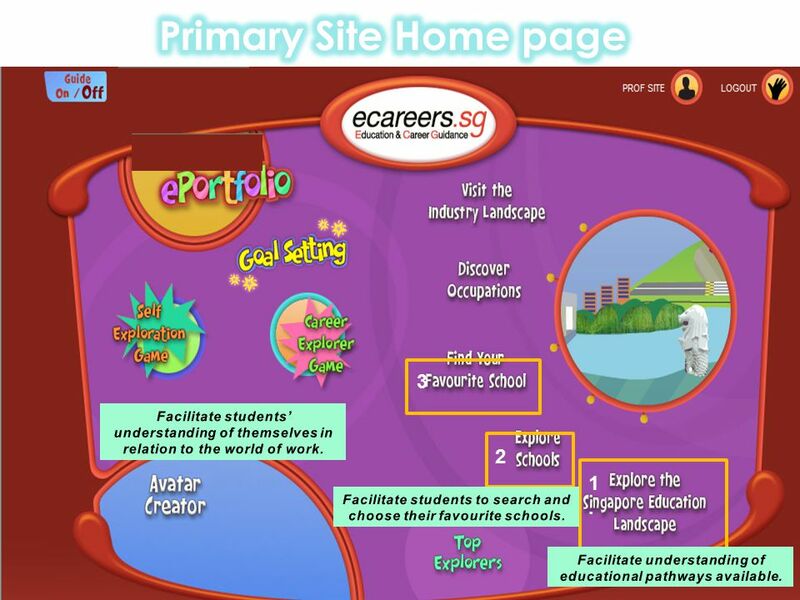 Explore the Singapore Education Landscape 2. 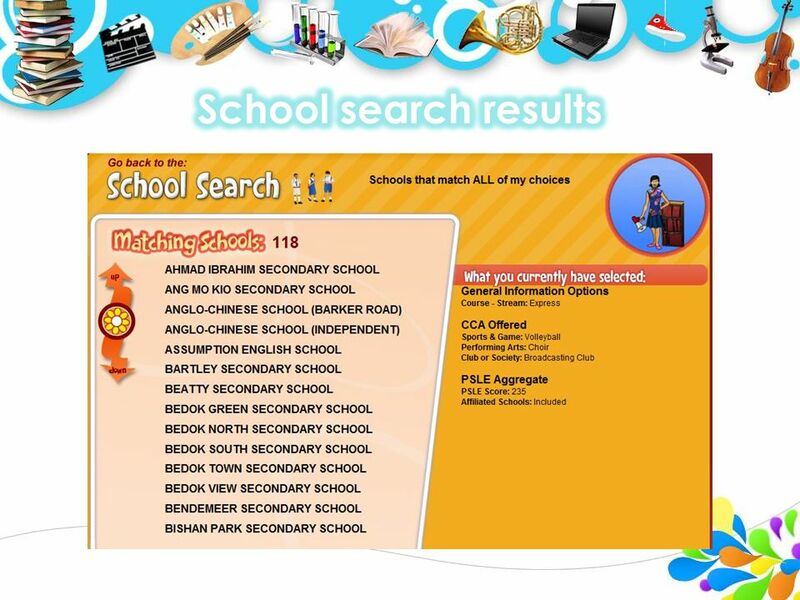 Explore schools (Search by alphabet) 3. 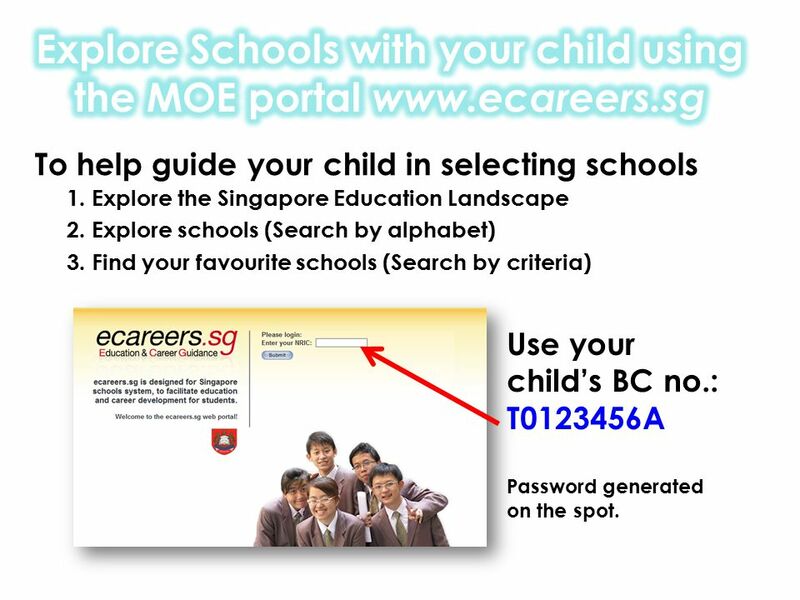 Find your favourite schools (Search by criteria) Use your child’s BC no. : T0123456A Password generated on the spot. 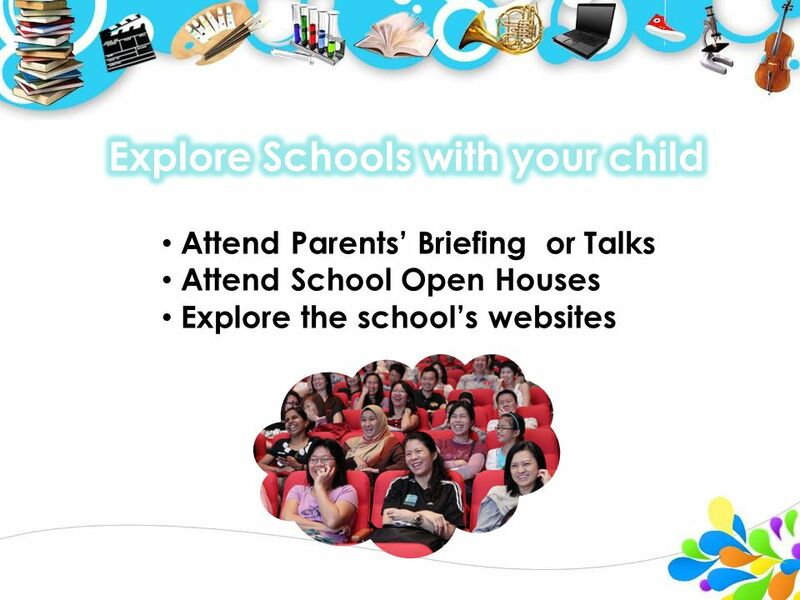 12 Copyright © Ministry of Education, Singapore. 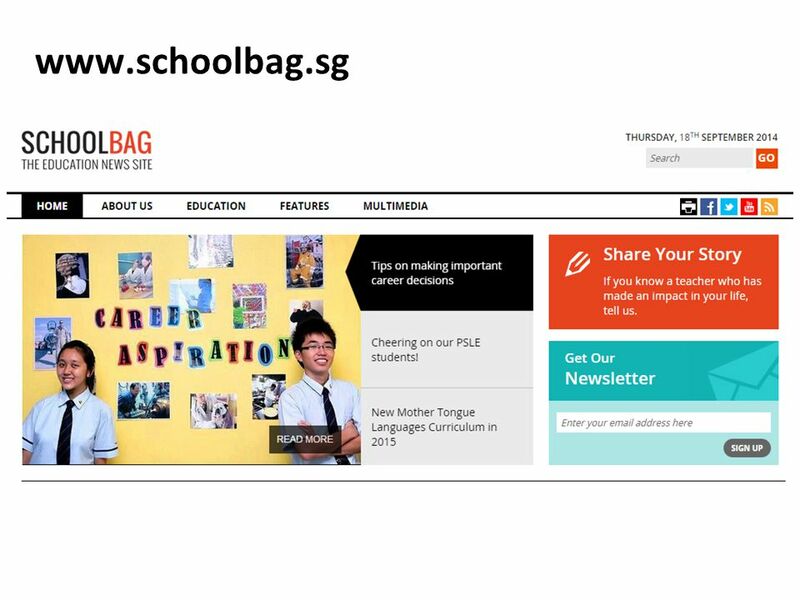 After PSLE, students have a range of options. 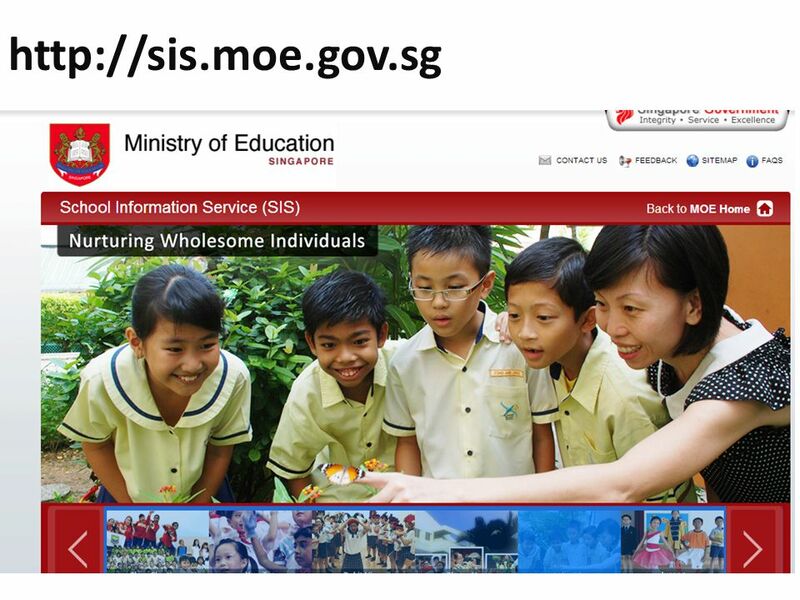 14 Copyright © Ministry of Education, Singapore. 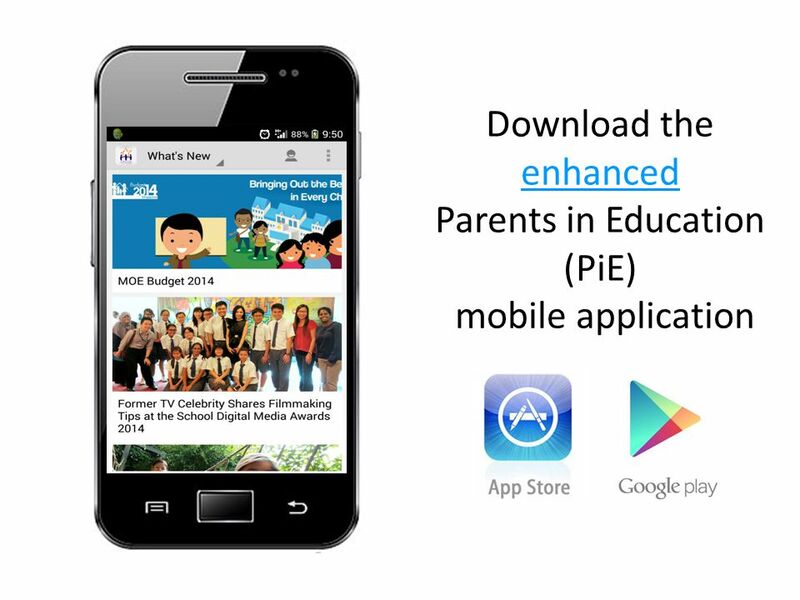 26 Copyright © Ministry of Education, Singapore. 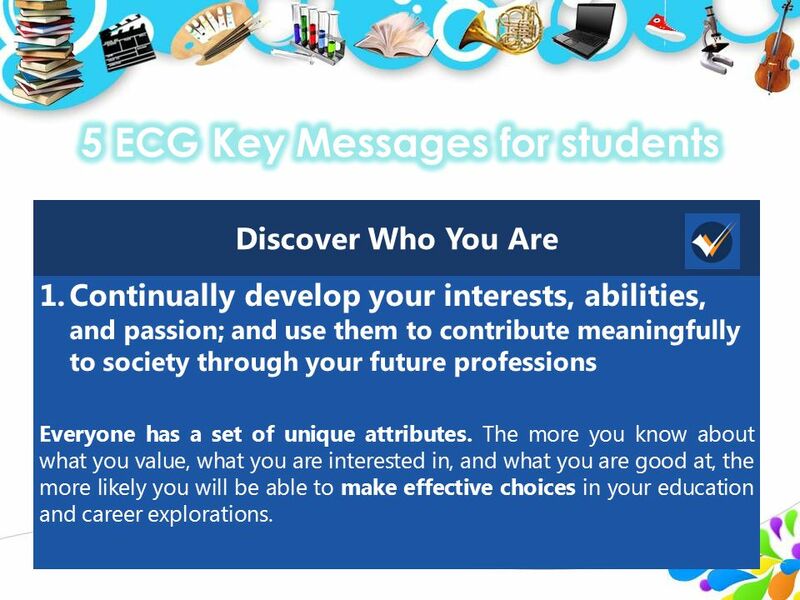 Discover Who You Are 1.Continually develop your interests, abilities, and passion; and use them to contribute meaningfully to society through your future professions Everyone has a set of unique attributes. The more you know about what you value, what you are interested in, and what you are good at, the more likely you will be able to make effective choices in your education and career explorations. 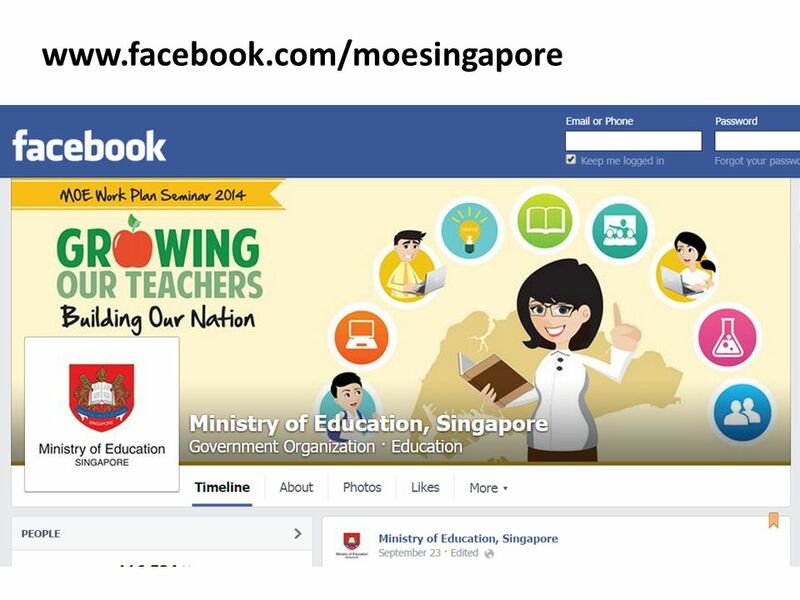 27 Copyright © Ministry of Education, Singapore. Navigating Pathways with Confidence 2. Learn more about the world of work, education, and career pathways that you can choose. Many pathways are worth taking, and there are opportunities for continuous learning and recognition. Explore the possible pathways and develop an understanding about the world of work within schooling years. There are no dead ends; through CET, you can continue to pursue your aspirations. 3. You can take pride in and add value to any job. Appreciate that each one of us can make the choice to perform the job to a high professional standard, and contribute to the bigger outcome. 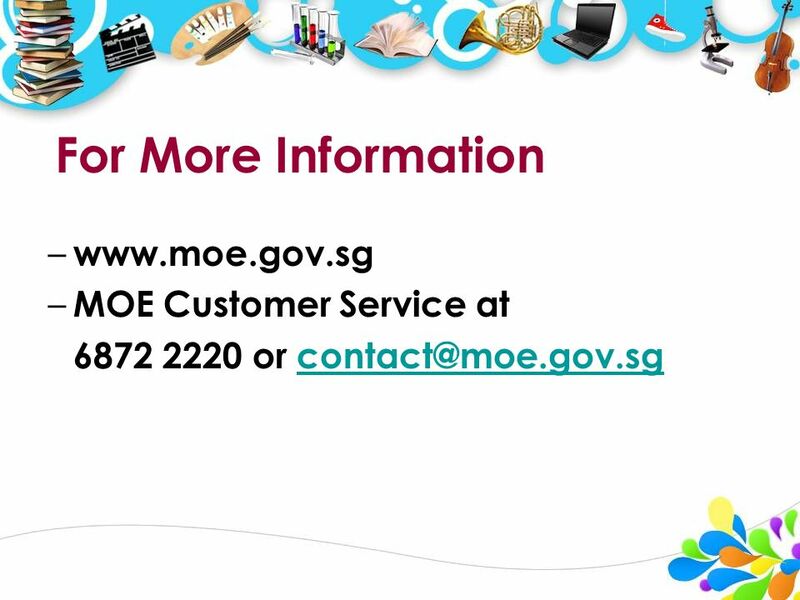 28 Copyright © Ministry of Education, Singapore. 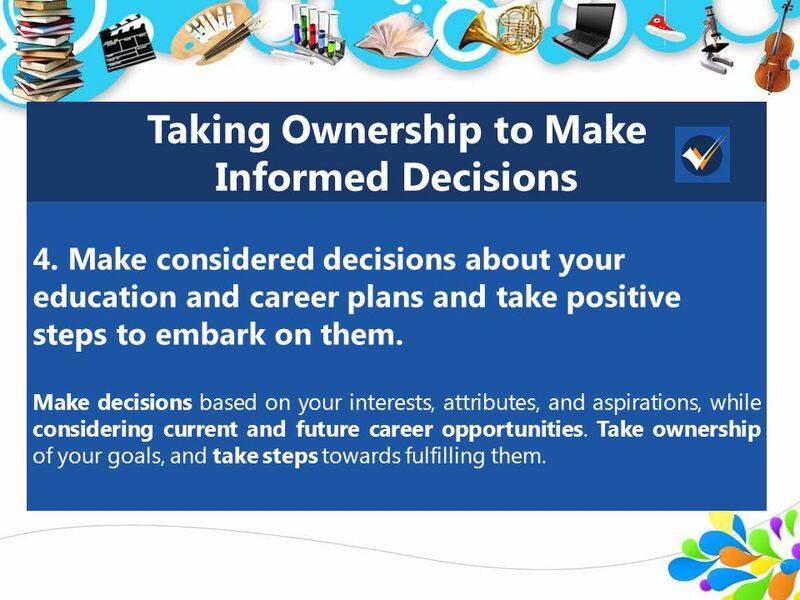 Taking Ownership to Make Informed Decisions 4. Make considered decisions about your education and career plans and take positive steps to embark on them. Make decisions based on your interests, attributes, and aspirations, while considering current and future career opportunities. Take ownership of your goals, and take steps towards fulfilling them. 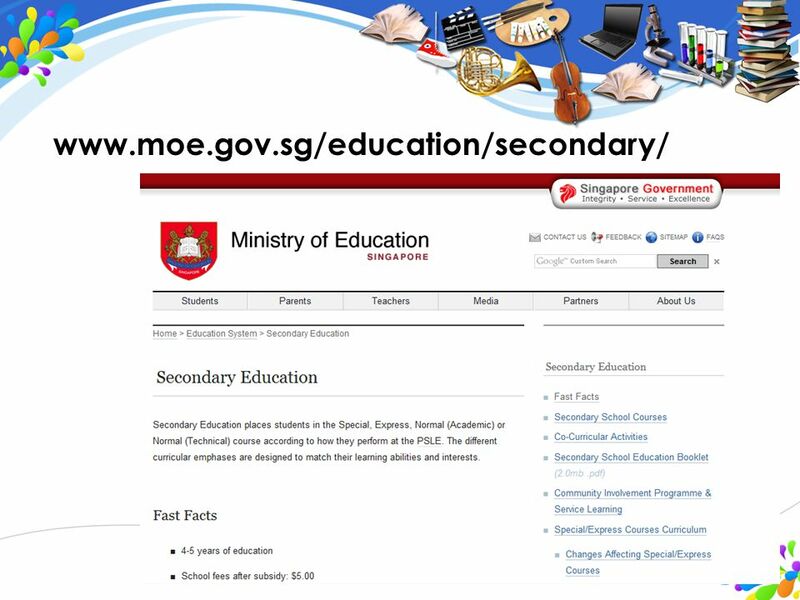 29 Copyright © Ministry of Education, Singapore. Be Resilient and Prepared for Life-Long Learning 5. 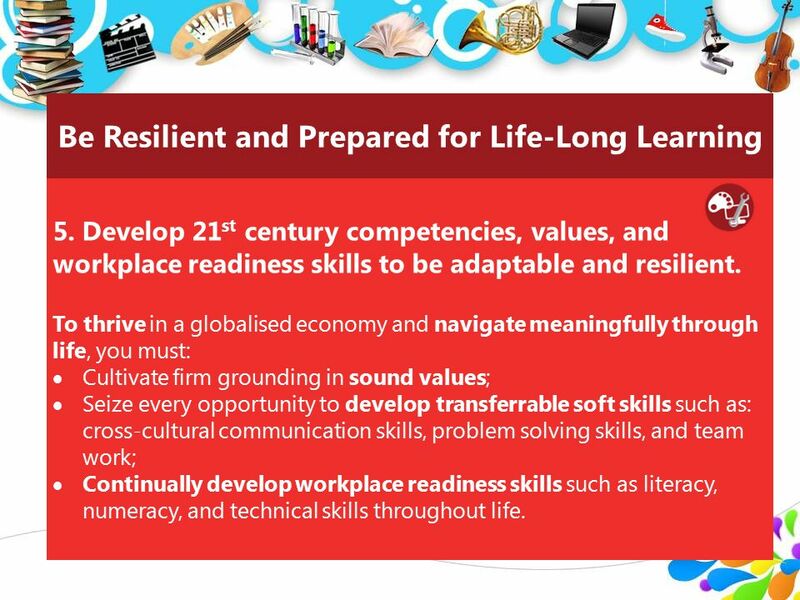 Develop 21 st century competencies, values, and workplace readiness skills to be adaptable and resilient. To thrive in a globalised economy and navigate meaningfully through life, you must:  Cultivate firm grounding in sound values;  Seize every opportunity to develop transferrable soft skills such as: cross-cultural communication skills, problem solving skills, and team work;  Continually develop workplace readiness skills such as literacy, numeracy, and technical skills throughout life. 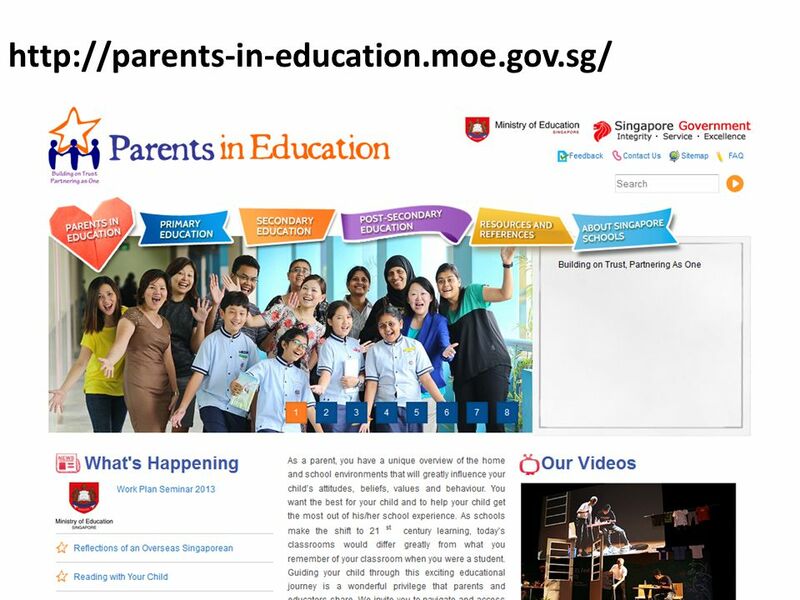 30 Copyright © Ministry of Education, Singapore. 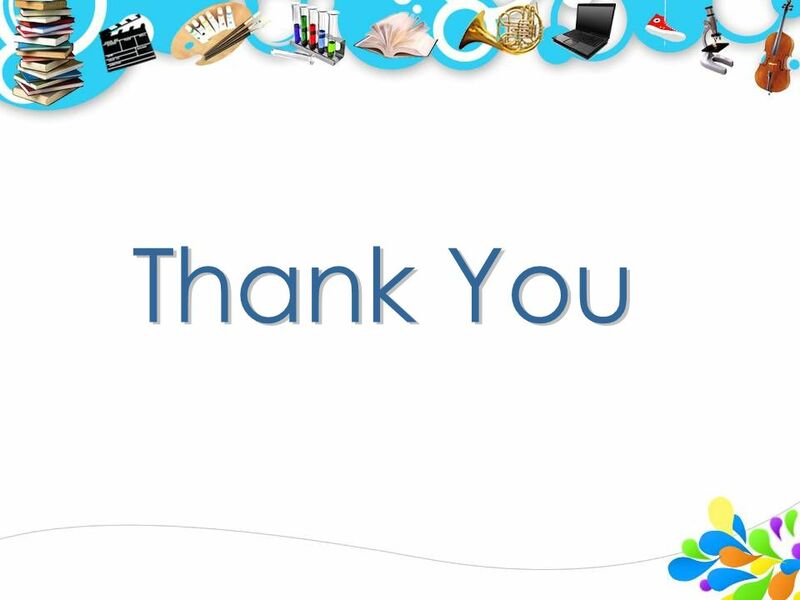 Download ppt "Integrity, the Foundation. People, our Focus. Learning, our Passion. Excellence, our Pursuit." (second logo) Positive Management / Supporting Change (second logo) Positive Management / Supporting Change. Hello and welcome My name is Stefanie Zizzo and I coach people to discover, transition and/or rejuvenate their personal and professional lives. 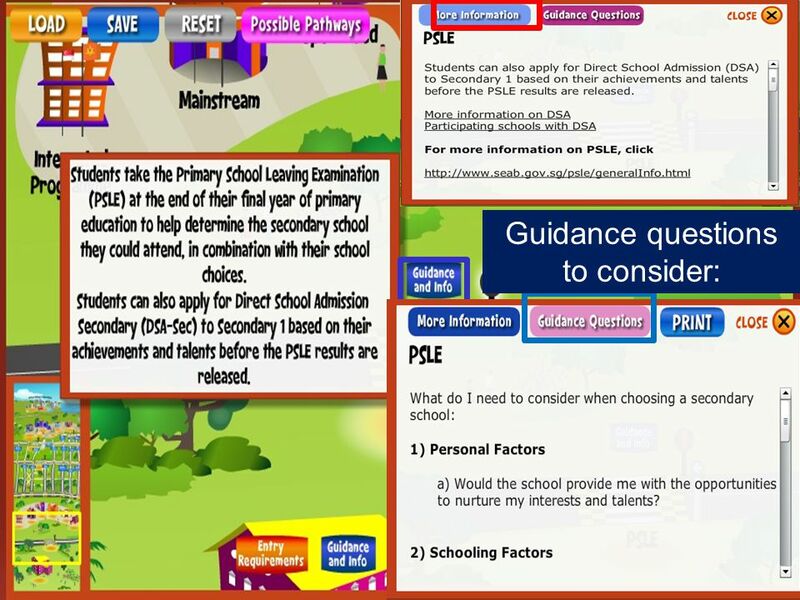 Personal, Social, Health and Economic education How PSHE education contributes to meeting the requirements of the Secondary National Curriculum. Compare and contrast the Malaysian Teacher Education Philosophy with Teacher Education Philosophy from the Singapore (East). ENTER TEACHING PROFESSION. Enhance Your College/Career Readiness Program with “Soft Skills” Dennis Trittin and Arlyn Lawrence LifeSmart Publishing, LLC LifeSmart Publishing, LLC. Motivating Our Students through Building Resiliency Woodlands Ring Secondary School Sharing at APS Global Education Conference July 2012.